Owner of the Painted Pot Liza Mendoza (right) with five-year-old Bryan Rumfelt and his grandmother, Donna Byrnes. 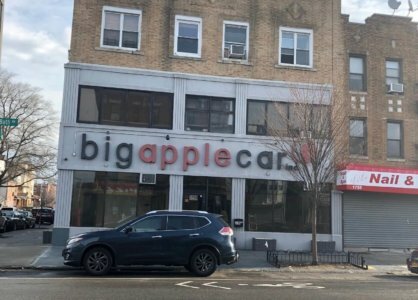 Thanks to an outpouring of support and a plea from one pint-sized patron, a longstanding Bay Ridge business will live on despite plans to close. After two decades on Third Avenue, owners of the Painted Pot at 8009 Third Ave. announced last month that its Ridge iteration would shutter come Jan. 31. Owner Liza Mendoza, 54, took to the business’s Facebook page on Dec. 30 to announce the coming closure. She’s since taken to the platform to put forth her change of heart – inspired, in large part, by five-year-old Ridge kid Bryan Rumfelt. But then, she got a message from Rumfelt’s father, Keith. “He sent me a video of his son just so upset,” Mendoza recalled. In the video, Rumfelt is seen approaching the window of the Painted Pot – his “favorite place ever,” his parents told this paper – and finding it closed for the afternoon. In the video, Rumfelt can also be seen reading a sign on the window warning of the coming closure, and breaking into hysterics. Mendoza couldn’t brush the video off. And so, Mendoza said she’d give it another go. “I made the decision to stay open and try in hopes that the new owners of the building will keep us as tenants and just hope for the best,” she told this paper. The Painted Pot – a haven for the creative that has thrived for 20 years on artists, young and old, stopping in to paint a pre-formed ceramic of their choosing – was the first of its “do-it-yourself” kind in a neighborhood that, before the rise of paint-and-sips, was in a league of its own. The shop offers walk-ins as well as classes, camps and even children’s parties. In its final days, Mendoza said, it became clear that there was another alternative. She’d originally intended to close the shop and focus on the business’s flagship in Cobble Hill and its third-coming in Park Slope. Now, she said, she’ll keep her sights set on sustaining all three. Rumfelt and his family stopped into the Painted Pot on Friday to meet Mendoza and revel in the good news. The youngster also received a gift card. “They are just exceptional people,” the owner said. “They’re all so supportive and Bryan himself is beyond his years. He’s really an old soul – a super smart, very sweet kid. “They reassured me that there’s many more people like them out there who care and who’ll support us,” she added. Bryan’s father reflected on his family’s special connection to the business. “I was saddened by the news of Painted Pot closing. It was a place my son loves. It’s a quaint and creative place for everyone in our community to enjoy. Rumfelt’s grandmother Donna Byrnes shared in the family’s elation. This isn’t the first time Rumfelt was in the news. He made this very newspaper in late 2017 after selling snacks to raise funds for Houston kids affected by Hurricane Harvey, which eventually led to a successful GoFundMe campaign. He was just four years old at the time. “I love Painted Pot so much,” he said. Had the Painted Pot gone ahead with its closure, its space would have become one of more than 60 vacant storefronts in southwest Brooklyn.